Hoppin’ John is traditionally a combination of white rice and field peas or black-eyed peas. 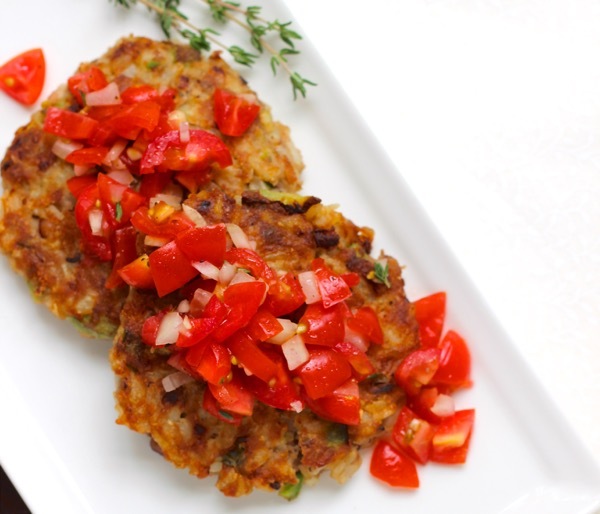 This recipe puts the two together in a patty and adds fresh tomatoes and herbs for even more flavor. Chock full of protein and fiber, this makes a hearty vegetarian meal. Make the salsa. In a small bowl, mix all ingredients. Set aside. Let the flavors meld. Make the patties. In a large bowl, mash the black-eyed peas with a fork or potato masher. Add the rice to the bowl. Set aside. In a medium skillet, heat half the olive oil over medium heat. Sauté the onion, garlic, bell pepper until soft. Add the sautéed vegetables and the remaining ingredients to the black-eyed pea and rice mixture. Mix well – you’ll want to use your hands. Once blended, score the mixture into four equal parts. Create two equal patties from each of the parts. If the patties are too loose, refrigerate them for an hour or overnight. Wipe out the skillet. Heat the rest of the olive oil over medium-high heat. Add the patties in batches and cook over medium heat until golden brown, about 3 minutes per side. Top the patties with the salsa. Serve.